How does Ground Water Recharge Reduce Foundation Settlement? Dewatering provides us a consolidated and stable soil deposit which ensures us less foundation settlement. It is not practical to consolidate soil deposit upto 100%; if it is done, no settlement will be occurred. When pore water pressure reduces, the effective stresses is increased and when it is done under a existing structure which is designed for estimated settlement after a time period, it is detrimental to foundation and structure supported by it. Thus fast settlement and obviously (if dewatering not done all around the foundation) differential settlement will be happened as settlement is more likely to occur near adjacent dewatering side. Our concern is here artificial recharging of ground. In this mitigation measure, water is injected into ground by using recharge wells in controlled way. Water from dewatering source or from other sources can be transported to recharge location (considerable distance from dewatering point should be maintained). The water should be investigated for treatment before recharging. The artificial recharge is provided to restrict or limit influence zone of dewatering. If should keep in mind that ground water level can be lower not only under installation of dewatering well but also under other method or construction work allowing gravity flow like excavation near foundation. The influence of drawdown depends on geological properties; the water available for recharge is also important. Increasing ground water level in this way practiced in Shanghai, resulting successful reduction in settlement velocity. Both water and summer irrigation is determined depending on artificial recharge. An average quantity of artificial recharge is 20000000 m3/year; in last 30 years 0.589 billion m3 water was recharged. In Shanghai only within two years accumulated settlement at city center was found 0.23 m (between 1956’s &1960’s) even after different settlement mitigation measure. Prediction of permeability may be wrong and more cost may involve than expected, especially when aquifer soil is unsaturated before recharge. 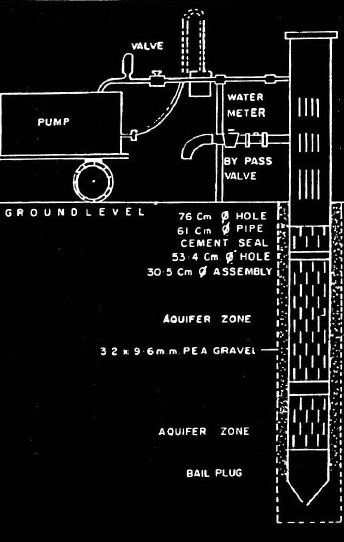 A correctly determined permeability may also involve more cost as wall of wells or wall of trenches may be clogged while pumping as pumped water may contain fines. Designed water head may practically not be possible to produce in some cases.